WordPress is now one of the most popular cms solution out there majority of blogs and website out there uses it. It is particularly a very seo-friendly platform which you can use to achieve big result any time any day, here is a quick tips on how you can easily add better robots.txt configuration / settings to your wp-powered cms website or blog. This is one of the most ignored part by majority of wp users who just placed their hope on the fact that wordpress is a near-perfect cms solution that deals with search engine friendly metrics and as such do not need any form of SEO tweaks to serve better, This was the kinda mentality I nurtured initially when I started out on the wp platform till I stumbled on the robots.txt settings of the old mashable.com which elevated my personal curiosity for a perfect wordpress robots.txt settings. After searching till now 2013 I realized there is no such thing as perfect robots.txt configuration for any website at all irrespective of the platform it is built on since each website needs be configured individually based on how we want them indexed by search engines. Adding a working robots.txt to any blog / website including those on the wordpress platform will greatly improve the site’s performance on any popular search engine out there since you will be instructing the search engines on how to index the blog / website, If you ask for my opinion on this I will authoritatively explain this as one of those wordpress seo performance tweaks out there you wouldn’t want to miss. Allow: /?mobile] using mine as example . If you want them indexed by search engines, they were added in a bid to prevent duplicate contents in search engine results . For others who want only their post topics and contents indexed by search engines you can add other lines in your robots.txt to prevent it eg. with any figure of your choice in seconds. Note that 3600 is equal to 1hr, so you can simply use this format to either reduce the frequency or increase it to days, weeks months etc. depending on how frequent your blog is updated. tweak accordingly following the previous mentions above. Also note that you can actually upload your images in two folder for sites that has images that are private and the ones that should be indexed adding the folder that contains the private images to your disallowed list. Please remember to replace Sitemap: http://myblogurl.com/index.xml with your blog / website current sitemap link. 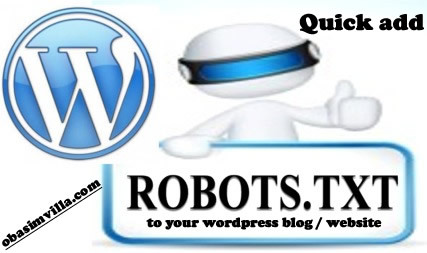 If you do not have access to your cpanel and wishes to add the robots.txt settings to your wordpress cms powered blog or website using a wordpress plugin, you can easily do so by visiting the wordpress plugin repository for WP Robots Txt that gives you the super privilege to add and edit your wp robots.txt configuration from your wordpress admin dashboard. Nice one bro, but i dont know most of those bots. This is great, i think am going to use it. How lovely would it be if it can work on blogger platform… Love this !!! Thanks for dropping by bro, it can actually work on blogger with just a little more tweak. But the question is “why bother when master google is taking care of it for you” ? that’s okay Don, hope you replaced Sitemap: http://myblogurl.com/index.xml with your own sitemap url ? Wow such great advice, thanks so much for sharing this knowledge. I”m off to update my blogs right now! I have a question: is WordPress a generally good program to use? I am using it and find it very good, but I have also heard that it is more difficult to place paid advertising on it. You really know your coding … did you go to school for this or are you self taught? The robot.txt and word press, both are well known elements in the world of online business. By using these source a web based business become easy to control and also get desired task from business promotion.